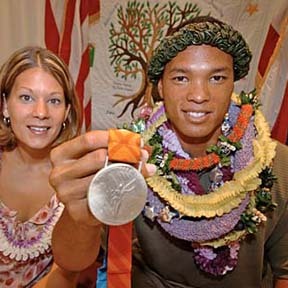 Showing off his silver medal, Bryan Clay was honored at the opening of the Windward Hoolaulea yesterday at Windward Community College. The Hawaii-grown decathlete later signed autographs and took pictures with well-wishers. Clay was with his wife, Sarah.